There was crowd control inside! Nice pic, somewhere my children would love to go! One of the best shops in the world! I prefer the internet lol. 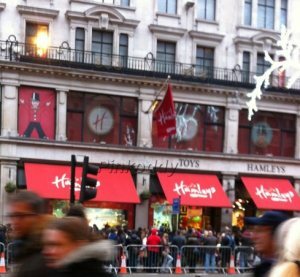 I hang my head in shame – I have never been to Hamleys! OMG! Love Hamleys but not when it’s like that! Mental. I would run screaming in the opposite direction! Anyone would think it was nearly Christmas or something!! I my I don’t think I could have faced that queue even for the best toy shop in the country! Yikes, we have nothing like Hamleys here in Spain… erm, I couldn’t handle it if we did. Did you go in? oh my that’s my idea of HELL! Love Hamley’s, so lucky that we’ve got one of our own in Cardiff now. I’ve never been to a Hamley’s…looks like I’m the only one :). Great picture. It is impossible to leave that shop in under two hours!